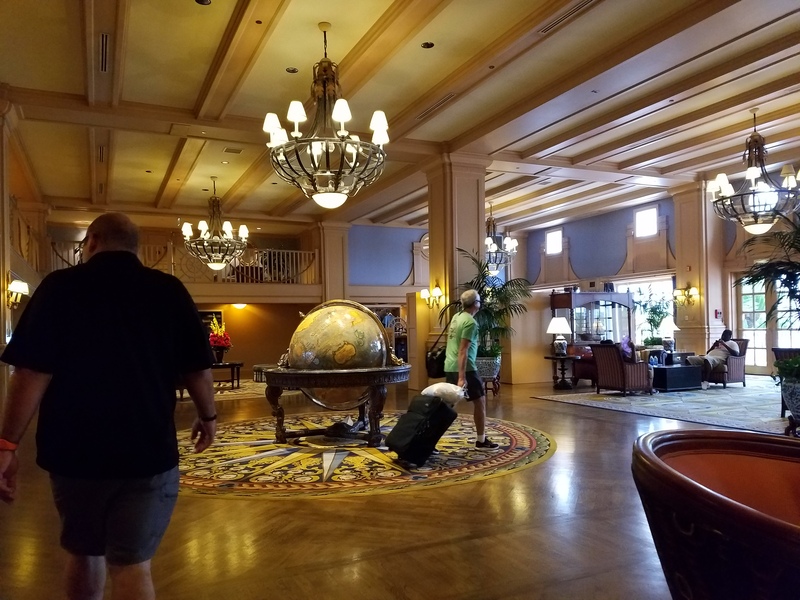 On a recent trip to Walt Disney World, we decided to finalize our “stay at every resort” challenge and booked a stay at Disney’s Yacht Club Resort. After countless trips, and visits to the resort, how have we never stayed here? 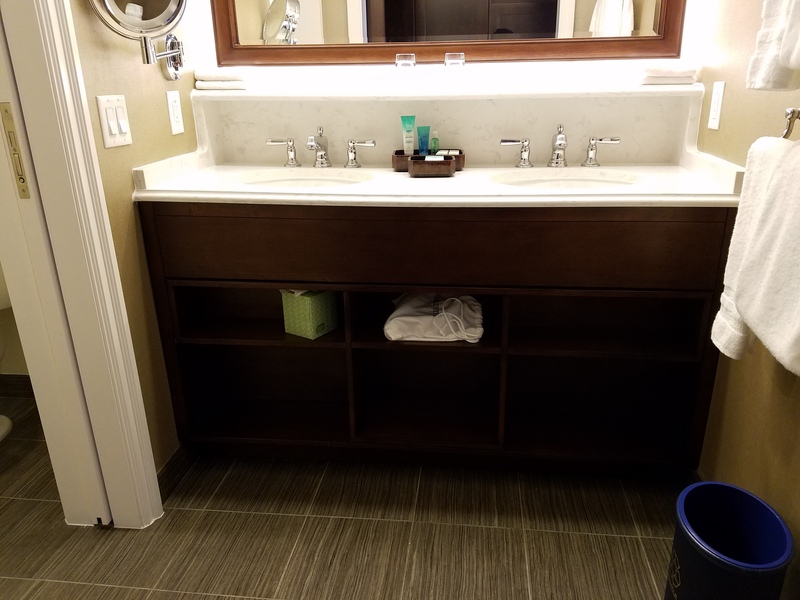 Well, I have a guess, and it may be because we are from New England and felt like the theming would be the same as where we live, so why not stay somewhere where the décor is different. But that was just silly. This picturesque seaside resort has just risen to the top of my favorites list! 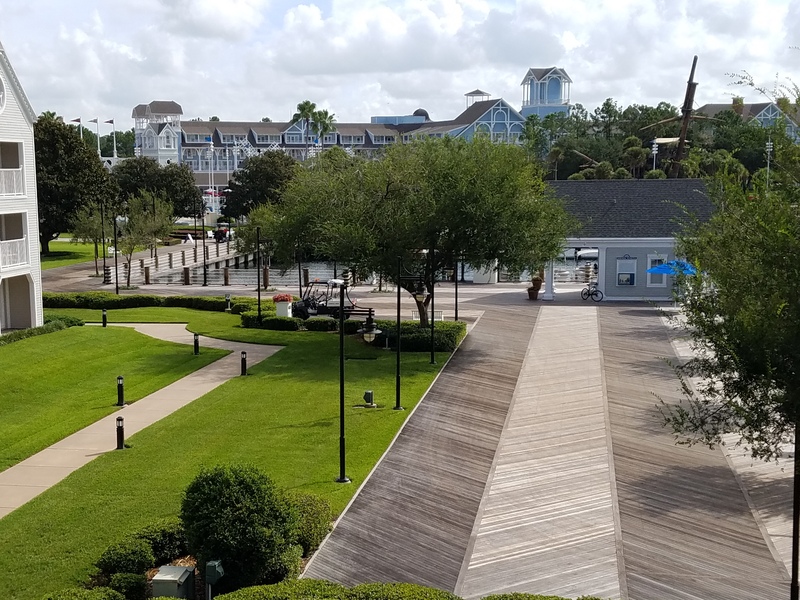 Yacht Club is one of Disney’s Deluxe Resorts. It is located behind Epcot on the Boardwalk. 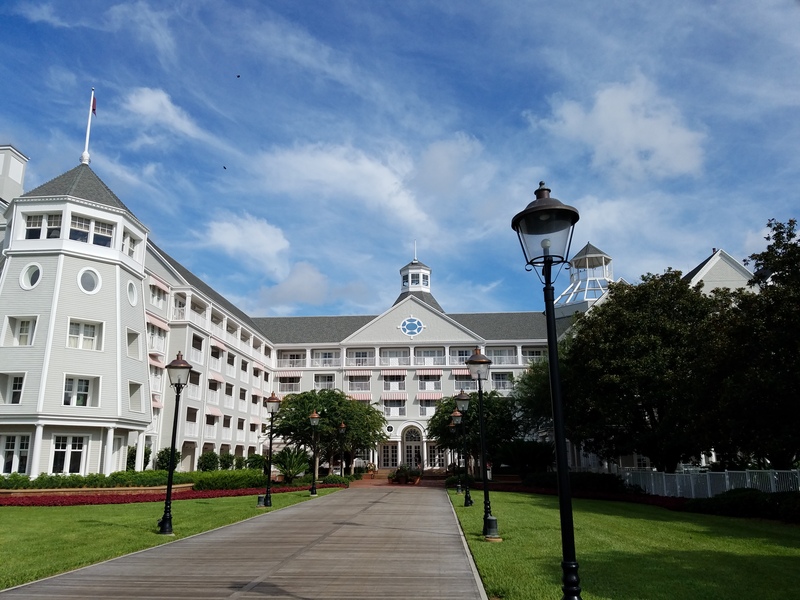 It connects to Disney’s Beach Club Resort in more ways than one. You can walk from one resort to the other, as they are literally connected. They share a pool (more on that later), Ship Shape fitness center, restaurants, and a fabulous location. much of the “hussle-bussle” we have seen in other resorts. The exterior of the resort has a gray and white clapboard appearance with a meticulously cared for lawn. The rooms at the Yacht Club are currently undergoing a beautiful modern refurbishment! 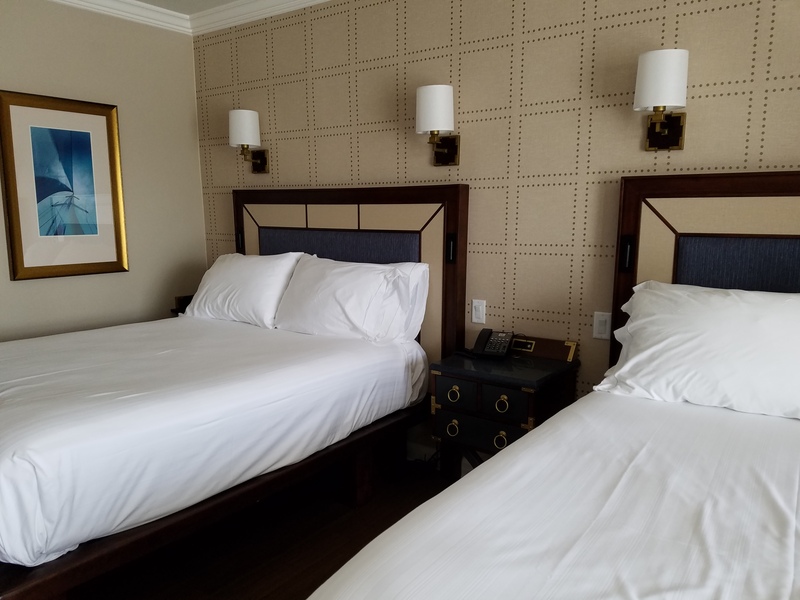 Upon entering the room I was surprised to see the changes already! The location of our room was at the end of one hallway. The walk from the lobby was lengthy, and one elevator was turned off due to construction. But there was a door to a staircase which put us on the Boardwalk quickly! It may be worthwhile to request a room closer to the lobby, but we enjoy the extra steps so it was no bother to us. 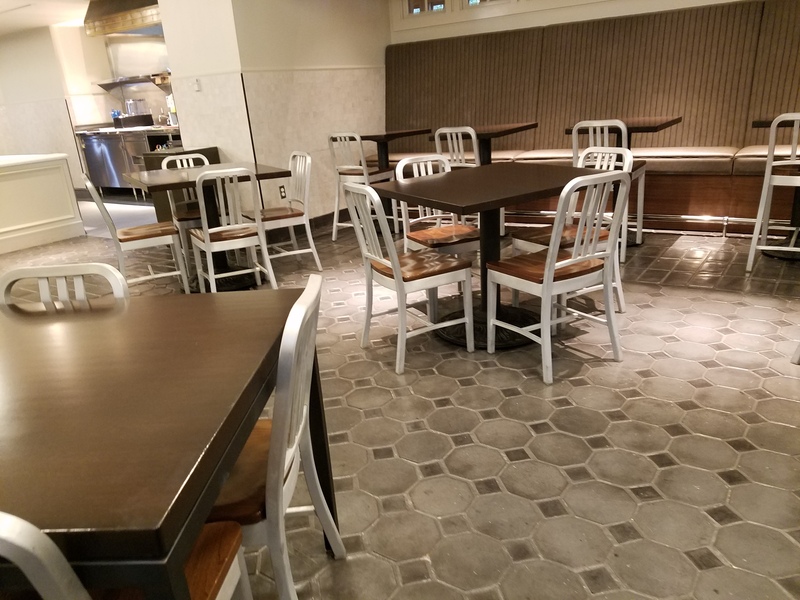 Restaurants at the resort are great too. When I was there in July, there was a bit of construction going on behind cleverly placed walls. 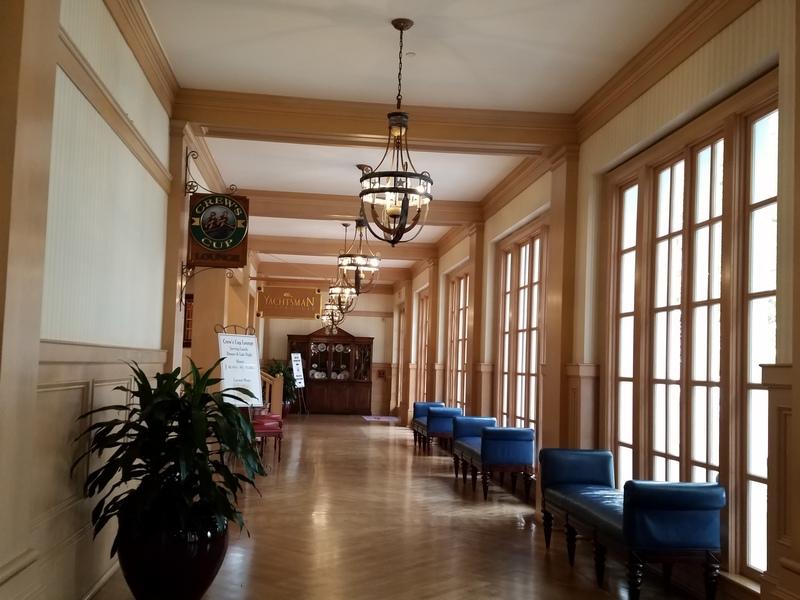 What’s happening behind them is the creation of a new lobby lounge and the new Ale & Compass Restaurant, which will replace the former Captain’s Grille. This new gastro-pub style restaurant will present a New England-inspired menu for breakfast, lunch, and dinner. The plans for the cozy lighthouse-inspired décor look really cool. 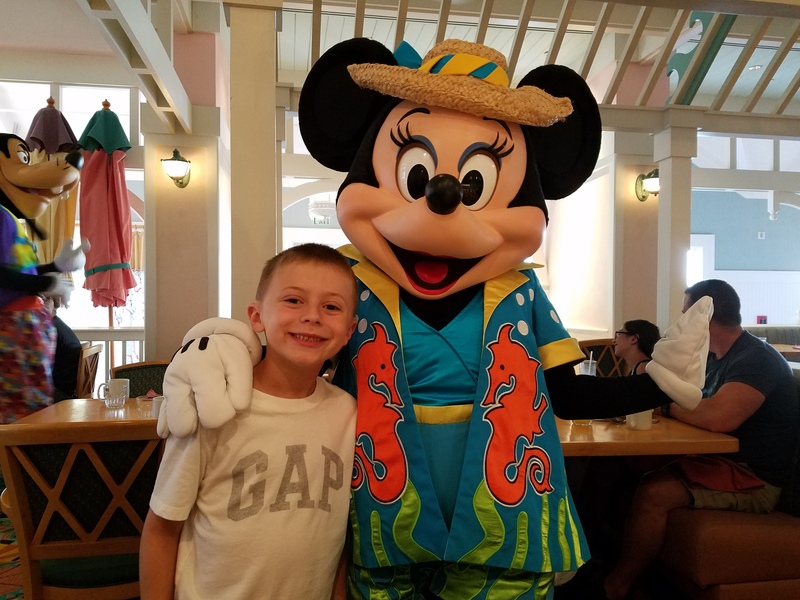 Other restaurants and lounges include the Marketplace at Ale & Compass for a quick bite to eat, Yachtsman Steakhouse, Crew’s Cup Lounge, Beaches ‘n Cream Soda Shop (you gotta order the No Way Jose, you’ll thank me), andCape May Café (which has a great character breakfast). There are even more but we didn’t visit them this trip. One afternoon we abandoned Epcot and had fun in the pool . Storm-a-Long Bay is often considered the “best” pool at a Disney resort, for many reasons. Most prominently is its sand bottom! Yes! when you get in the pool, you are walking on sand! Weird at first, but then it seems really neat. 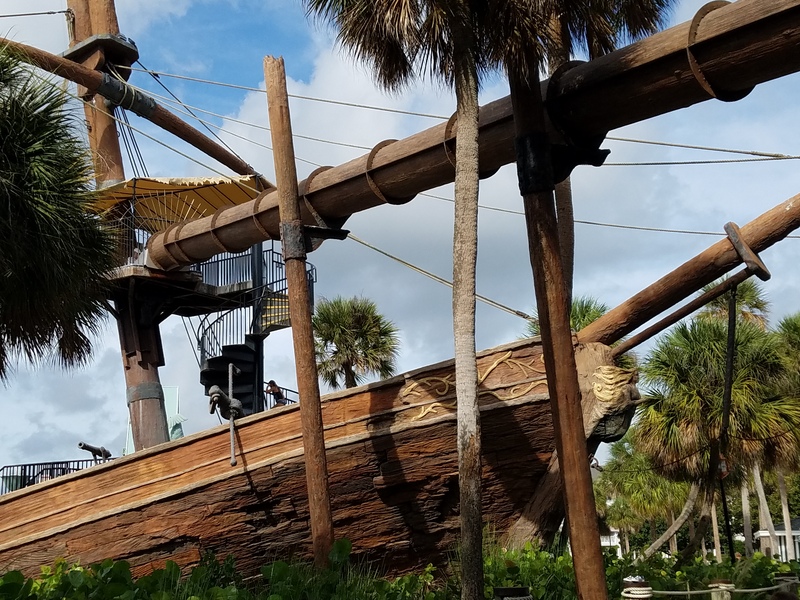 There is also a lazy river and amazing pirate-ship slide! Now, I don’t do water slides, but I did this one and loved it! Because of its popularity, cast members do check magic bands to ensure you are staying at Yacht Club or Beach Club and give you a bracelet granting access for the day. Another great feature of this resort is its location. You can quickly walk to Epcot, a little bit longer walk to Hollywood Studios, or you can take a short boat ride! My family and I just loved this resort. The beautiful décor, quiet ambience, super cool pool, variety of restaurants, and location to the parks makes it the perfect choice. We will be staying here again on our next trip! As an aside, this resort would be PERFECT for a honeymoon or couples getaway!